Recently, IHOP (also known as the International House of Pancakes) made big news when the chain trolled the public by saying it was changing it’s name to IHOB. Even though this change left everyone shaking their collective heads, many of us assumed this was real news. We also assumed the B stood for “breakfast” when in fact, it stood for burgers. Also, it ended up just being an advertising campaign to announce the chain was now selling burgers. Recently, IHOP made another announcement and this one (even though it seems like a joke) is actually real. The company announced this week that it would be selling a limited-edition beer. The beer is named IHOPS Pumpkin Pancake Stout and will be brewed in collaboration with Kingston, New York’s award-winning Keegan Ales. If you couldn’t already tell from the name, this stout combines the fall flavor we all know and love (pumpkin spice) with buttermilk pancakes to create potentially the perfect fall beer. That is, as long as it isn’t too sweet. Maybe we should pair it with a side of bacon or sausage to cut the sweetness down. 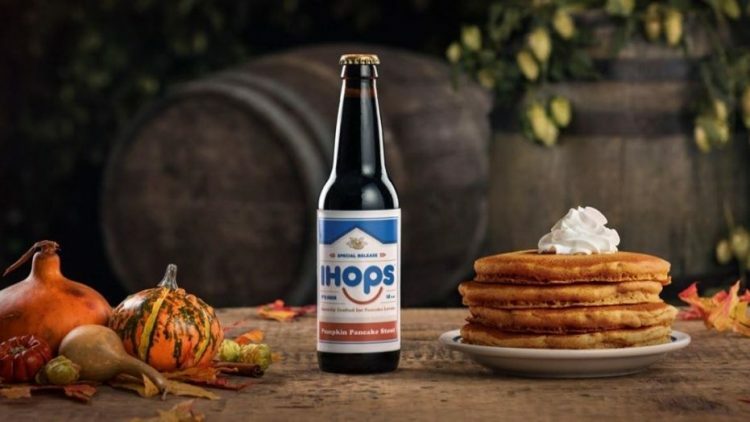 The beer is based on one of IHOP’s newest menu items: pumpkin spice pancakes as well as other seasonal items that are available until the end of October. “Every year, our guests eagerly await the return of our seasonal pancakes: Pumpkin Spice, Cinn-A-Stack, and a new combination of the two this year, Pumpkin Cinn-A-Stacks, which tastes just like a pumpkin pie and a cinnamon roll married and had a food baby,” said Brad Haley, chief marketing officer at IHOP, in a press release. The beer will officially make it’s debut this weekend at the 5th annual Bacon and Beer Classic in Flushing Meadows, New York, and will be available at select bars across New York and the surrounding states. You can visit IHOP’s website to find a location near you.